Enrique Peñalosa, former mayor of Bogotá, believes that one day cities of the developing world will offer us lessons about providing everyone with equal access to happiness. It feels a bit strange to be sitting in the middle of one of the world's wealthiest neighborhoods, and to be so thoroughly engrossed in conversation about the prospects of poor cities across the planet. But here, in an office building at New York University on the island of Manhattan, is where former Bogotá mayor Enrique Peñalosa is working on a book about how life can be improved for people in mega-cities of the developing world. That is, when he's not in Beijing or Delhi or Dar-es-Salaam or Jakarta or Mexico City sharing his visionary plans with local leaders. Peñalosa's ideas stand as beacon of hope for cities of the South, which will absorb much of the world's population growth over the next half-century. These are places with the usual complications of rapid urban expansion--pollution, public health, slums, crime, unemployment, sprawl, corruption, traffic, all of which are aggravated by the fact that most of these cities' citizens live in deep poverty. Based on his experiences in Bogotá, however, Peñalosa believes it's a major mistake to give up on these places, no matter how out-of-control their problems appear. Some observers claim that this city of 6.6 million offers practical lessons not just for helping poor cities, but for upgrading the quality of life in Western cities. "If we in the Third World measure our success or failure as a society in terms of income, we would have to classify ourselves as losers until the end of time," declares Peñalosa, a tall man in casual clothes with salt-and-pepper hair and trim beard, who looks more like a coach than a politician or professor. "With our limited resources, we have to invent other ways to measure success. This might mean that all kids have access to sports facilities, libraries, parks, schools, nurseries." This is exactly what Peñalosa set out to do as mayor of Colombia's capital city. And the results were impressive enough that Colombia finally got international press about something other than drug trafficking, guerrilla kidnappings, and bloody civil war. Indeed, some observers claim that this city of 6.6 million offers practical lessons not just for helping poor cities, but for upgrading the quality of life in Western cities. Created the Trans-Milenio, a bus rapid transit system (BRT), which now carries a half-million passengers daily on special bus lanes that offer most of the advantages of a metro at a fraction of the cost. Built 52 new schools, refurbished 150 others, added 14,000 computers to the public school system, and increased student enrollment by 34 percent. Established or refurbished 1200 parks and playgrounds throughout the city. Built three large and 10 neighborhood libraries. Built 100 nurseries for children under five, and found permanent sources of funding. Improved life in the slums by bringing water to 100 percent of Bogotá households, and buying undeveloped land on the outskirts of the city to prevent real estate speculation and ensure that it will be developed as affordable housing with electrical, sewage, and telephone service as well as space reserved for parks, schools, and greenways. Reclaimed the sidewalks from motorists, who traditionally saw them as either a passing lane or a parking lot. "I was almost impeached by the car-owning upper classes," Peñalosa notes, "but it was popular with everyone else." Established 300 kilometers of separated bikeways, the largest network in the developing world. Created the world's longest pedestrian street, 17 kilometers crossing much of the city, as well as a 45- kilometer greenway along a path that had been originally slated for an eight-lane highway. Reduced traffic by 40 percent with a system where motorists must leave cars at home during rush hour two days a week. He also raised parking fees and local gas taxes, with half of the proceeds going to fund the new bus transit system. Inaugurated an annual car-free day, where everyone from CEOs to janitors had to had commute to work in some way other than a private automobile. PPS has named Peñalosa to its great "placemakers" list alongside such giants in the field as Jane Jacobs. David Burwell, a strategic analyst with PPS, who has long experience working on environmental, transportation, and community issues, calls Peñalosa, "One of the great public servants of our time. He views cities as being planned for a purpose--to create human well-being. He's got a great sense of what a leader should do--to promote human happiness." Let's just imagine how you want your home to be. How you want your kids to live. Do you want to walk or drive to get bread? No one can accuse Peñalosa of thinking small. As we sit in his office at New York University's Center for Latin American and Caribbean Studies, looking out on the bustle of Greenwich Village below, he muses about the day when cities of the developing world might surpass New York or Paris in terms of sheer joyfulness in urban living. As he confides this, his reserved manner gives way to a broad and infectious grin, which I assume has proved very useful through the years in helping him get things done. "You must remember that Third World cities are still two-thirds unbuilt," he tells me, explaining that by 2050 most of these cities will be three times larger than today, which means there is still a lot of city planning to do. "We can take advantage of what's been done--mistakes and successes--by cities in the developing world." Opening the window and gazing down at sidewalks filled with people, he says, "I love New York. I feel so much energy here. But there is so much more that you could do: pedestrian streets, more parks, bikeways, open up the waterfronts. The old sections of European cities are very beautiful. The closest thing you'll see to what I am talking about are Danish or Dutch cities, but even they could be improved. They need a network of pedestrian streets through the whole city, not just the center, and they need more sports facilities and parks and green space. We could do all these things in Bogotá and other developing cities. I think you can have a city that combines the best of suburbs and the best of old cities. "In Spanish we have this saying that it doesn't cost anything to dream," he notes, "So I say let's play. Let's just imagine how you want your home to be. How you want your kids to live. Do you want to walk or drive to get bread? That's the basis of thinking about cities. We have not given enough thought to how we live. We have left too many of these decisions to others." A more serious look now crosses his face. "Ninety-nine percent of Third World people have never seen a Dutch or Danish city, where you see people on bikes everywhere. A city full of cars is not a good model for us." "The images we get from the United States are a very damaging model to Third World cities," he continues. "We need to avoid undesirable developments such an urban sprawl. People in the U.S. now recognize there are problems with building cities for cars and not for people, and we in the Third World need to know that. Pedestrians and bicyclists should be given as much importance as motor-vehicles; even more so in developing country cities, where most households don't own cars." It's not that Peñalosa hates cars. It's that he loves lively public places where people of all backgrounds gather to enjoy themselves and each other - places that barely exist in cities where the car is king. These places are even more important in poor cities than in wealthy ones, he says, because poor people have nowhere else to go. "We all need to see other people. We need to see green. Wealthy people can do that at clubs and private facilities. But most people can only do it in public squares, parks, libraries, sidewalks, greenways, public transit," he declares, turning back for another look out the window. He reminds me of a caged animal here inside the office, ready at any moment to break away for the freedom of the city outside. "The least a democratic society should do is to offer people wonderful public spaces." 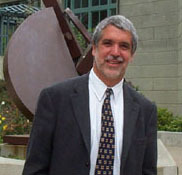 Enrique Peñalosa has become an international star of sorts among green urban designers, so I automatically assumed he was trained as a city planner and inspired by long involvement in the environmental movement. But the truth is that he arrived at these ideas from a completely different direction. "My focus has always been social--how you can help the most people for the greater public good. But if you are thinking constantly about how to help the environment, you come to the same conclusions." Growing up in the '60s, when revolutionary fervor in South America was strong, Peñalosa became an ardent advocate of social justice and income redistribution at an early age--views that were solidified upon moving to suburban Washington, D.C, where the only other Latinos he encountered worked as bus boys and maids. "I was obsessed with socialism," he recalls. Attending Duke University on a soccer scholarship, he studied economics and history and later moved to Paris to earn a doctoral degree in management and public administration. Paris was a marvelous education in the possibilities of urban living, and he returned home with aspirations of bringing European-style city comforts to the working-class of Bogotá. The experience of his early years out of school, managing a greenhouse operation, working in an investment banking firm, and dabbling in politics, redefined his political views, as seen by the title of his first book, Capitalism: The Best Option. But this does not mean, he hastens to tell me, that he abandoned the quest for social justice. "We live in the post-communism period, in which many have assumed equality as a social goal is obsolete," he explains. "Although income equality as a concept does not jibe with market economy, we can seek to achieve quality-of-life equality. Urban policy can be a powerful means to achieve equality in quality-of-life." So over the last 20 years, Peñalosa - greatly influenced by his father, a one-time Bogotá city council member and official of the Inter-American Development Bank in Washington, D.C., who became the Secretary General of the United Nation's first Habitat conference on human settlement - has been looking for new ways to level the playing field between poor citizens and wealthier ones. "The least a democratic society should do," he says, "is to offer people wonderful public spaces. Public spaces are not a frivolity. They are just as important as hospitals and schools. They create a sense of belonging. This creates a different type of society - a society where people of all income levels meet in public space is a more integrated, socially healthier one." "In Bogotá, our goal was to make a city for all the children. The measure of a good city is one where a child on a tricycle or bicycle can safely go anywhere. If a city is good for children, it will be good for everybody else. Over the last 80 years we have been making cities much more for cars' mobility than for children's happiness." Peñalosa has been taking this message throughout the world in lecture tours sponsored by the World Bank; the Institute for Transportation and Development Policy (ITDP), a New York-based group promoting sustainable transportation in the developing world; and Interface for Cycling Expertise (I-CE), a Utrecht, Netherlands-based group promoting bike transportation. "You cannot overestimate the impact Peñalosa has had, on a personal level, in ten or twelve countries," notes Walter Hook, director of ITDP. "He takes these ideas, which can be rather dry, and speaks emotionally about the ways they affect people's lives. He has the ability to change how people think about cities. He's a revolution that way." Bogotá's Bus Rapid Transit (BRT) system is of particular interest to public officials in the developing world who want to defuse traffic jams but don't have funds to build a metro or tram system. Hook gives Peñalosa major credit for the decision to build a new busway in Jakarta, Indonesia, which opened to great acclaim last February. He also played a role in getting things rolling for busways in Bejing, Delhi, Capetown, Lima and Dar-es-Salaam in Tanzania, as well as ambitious bikeway projects in Mexico City, Capetown and Dakar, Senegal. Where new areas are being urbanized, large networks of such pedestrian and bicycle roads can easily be incorporated. Peñalosa outlined his vision for developing cities of the 21st century city in appealing detail as part of a speech last May for the Association of Sustainable Mobility in Switzerland: "I invite you to imagine for a minute a 20-mile long, 50-feet wide road only for pedestrians and bicycles through your neighborhood, regardless whether you live downtown or in a suburb. At intersections there could either be bridges, underpasses for motor vehicles, or simply traffic lights. Ideally it would link your neighborhood to a waterfront, a large park, a shopping area, a library and schools, just to mention a few examples. You and your neighbors could ride bicycles with your children to the beach or the library, go jogging. Older citizens could walk to a café, and babies could be taken out for fresh air in their carriages. It could completely transform a neighborhood's life and even significantly increase property values. Yet the cost of creating such a road would be minimal, if done at the time of laying city plans. Where new areas are being urbanized, large networks of such pedestrian and bicycle roads can easily be incorporated." After several hours of conversation, interrupted once by university maintenance men coming in to fix the loose window that Peñalosa favors for surveying the city below--a moment in which I saw the mayor's charm and persuasiveness in full blossom as he inquired if they were going to seal it permanently shut--it is now time for lunch. Peñalosa tentatively suggests we could go to the faculty club, a presumably swank spot. I counteroffer that Washington Square Park is only two blocks away, and see a smile light up his face. We swing by a local deli, where Peñalosa holds his own in simultaneous Spanish conversations with two clerks from the Dominican Republic while continuing to answer my questions in English, and then stroll over to Washington Square to enjoy a lovely summer afternoon. The park, the heart of Greenwich Village and ground zero for any number of international social trends from '60s folk music to break dancing, was saved from plans to run a highway right through it by protests from the neighborhood. As Peñalosa and I sit down on a bench with our sandwiches, we stop talking for the first time all day and just watch the show. Kids play. Mothers chat. Students read. Construction workers sip lattes. Business executives nap. Street people sing. When a pretty woman glides by on her bike, Peñalosa nods his head and laughs, "Bikes are a wonderful thing in cities. They're sensual. You can watch all the other people on their bikes, meet your friends, stop to talk." "All these issues we're talking about are from the soul," he adds. "Economics, urban planning, ecology are only the means. Happiness is the goal. Places like this make people happy. We have a word in Spanish, ganas, which means a burning desire. 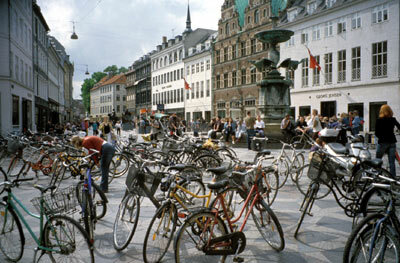 I have ganas about public life..."
Bicycles on a Copenhagen street. Just then a young couple walks by pushing their bikes. He looks over at me, his brown eyes shining. "Have you seen all the bikes in Copenhagen?" Penalosa concluded his visiting professorship at NYU a few weeks after this interview and moved back to Bogotá to work with a foundation he started Por el Pais Que Queremos (For the Country We Want and Wish). He is considering a run for Colombia's presidency in 2006.